We use our baby’s cute whale tub as a portable crib so baby gets to sit in her other bathtub during bath time. Mommy fills a red bucket with warm water and relies on a big pitcher to pour water from the bucket into the blue tub. 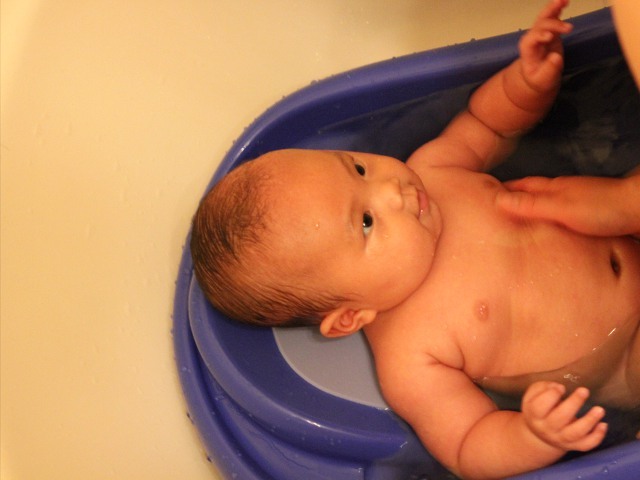 Since the tub has skid-resistant backing, baby can just lie back and play during her whole bath. Luckily we never had to come up with fancy routines to keep baby entertained at bath time. She likes playing with warm water so she keeps herself entertained while we use gentle baby shampoo to get her clean. When she is particularly dirty we have to apply the shampoo more than once, but it seems safer to use more of the gentle product rather than use a potentially-unsafe product. As our daughter gets older she seems to get more excited to play in the water. Some parents have taken their babies to swimming lessons from as early as five weeks and we are considering having Arya take a swim class some time during the summer. For now she enjoys a bi-weekly play session in the bath tub.